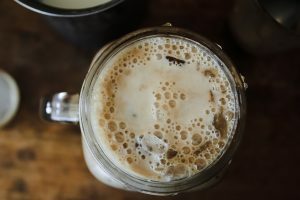 How to make a perfect Iced Coffee Latte healthier? Well you can use a dairy high fat whipped cream, but a better way is to use a cold soluble foaming creamer instead.Cold soluble foaming creamer is generating a foam creamy layer and is low in vegetable fat. Prepare: Tall glass, coffee cup, spoon, cold milk or water. Prepare: Tall glass, coffee cup, spoon, cold milk and water, coffee extract. Step 1: Pour 25 g of MILKY FOAM into a tall glass. Add 120 cold milk or water and stir continuously until dissolved. Wait 1 minute until the foam is formed. Step 2: Pour 2,5 g of coffee extract into a small cup or glass. Ad 80 ml water and again stir continuously until the drink is dissolved. Step 3: Add the coffee drink into the tall glass containing the milky foam.